Retirement: pension or lump sum - or both? Retirement savings can be paid out on retirement either in full or in part as a lump sum or as a lifelong pension. Ordinary retirement age in the Syngenta Pension Fund at present is 65 for men and women. Early retirement is possible from the age of 60. On retirement, the retirement savings may be converted into a pension and taken in whole or in part as a lump sum. Retirement can be taken in one or more steps (partial retirement). How is a retirement pension calculated? The existing retirement savings are converted into a lifelong pension by means of the conversion rate. Example: retirement age at 65. How high is the conversion rate? The level of the conversion rate depends on the age at retirement. Is it possible to pay extra contributions to make up for a reduced pension? If you retire before the age of 65, it is possible to pay extra contributions to make up for the reduction in pension resulting from early retirement. What are the conditions for a partial retirement? In the case of partial retirement, the employment contract must be reduced by at least 30 percent. Partial retirement is only possible with the agreement of the employer. What benefits do I receive in the case of partial retirement? 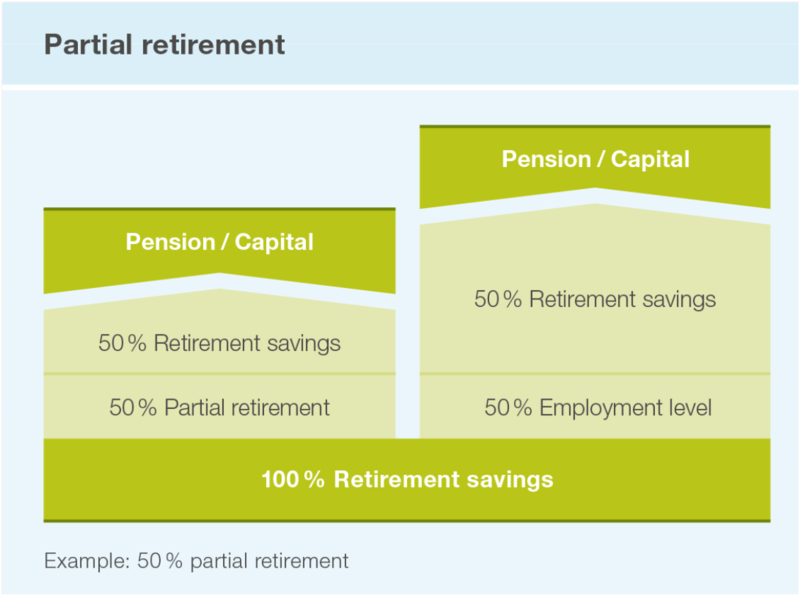 The retirement savings are split in line with the reduction in the level of employment. The capital selected for the partial retirement may be converted into a pension. It is also possible to take it wholly or in part as a lump sum. When does a lump-sum option have to be registered? The Pension Fund must be notified of the decision to opt for a lump sum payment three months before retirement at the latest. Why is the spouse’s signature needed in the case of a lump-sum payment? If a lump sum is taken, the co-insured pension of the spouse is also reduced with the retirement pension. 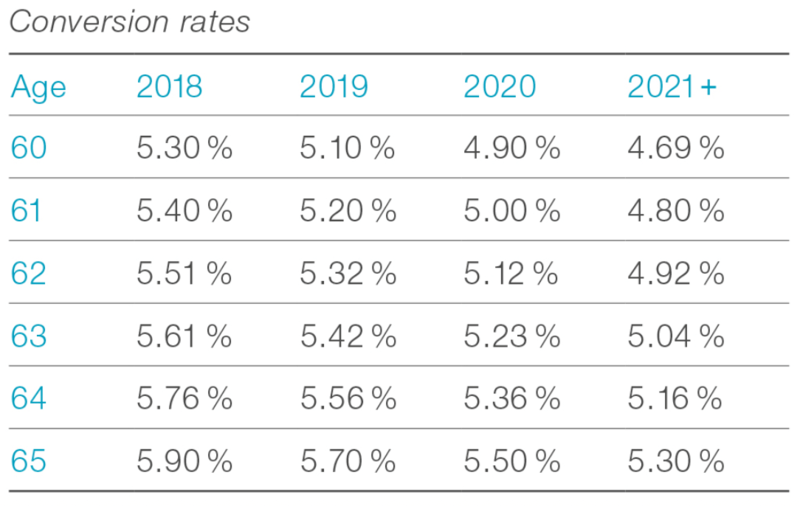 Conversion rate: This percentage is used to convert the retirement savings into a lifelong pension on retirement. Bridging pension: This temporary pension is paid out until the statutory retirement age for the state pension is reached. You are free to select the level of bridging pension up to an amount equal to the maximum state pension. OASI: Old-Age and Survivors’ Insurance (the state pension scheme). Retirement child pension: If the insured member has children aged less than 20 years (or 25 years if they are still in education) a pension equal to 20 percent of the retirement pension is additionally paid out for each child.